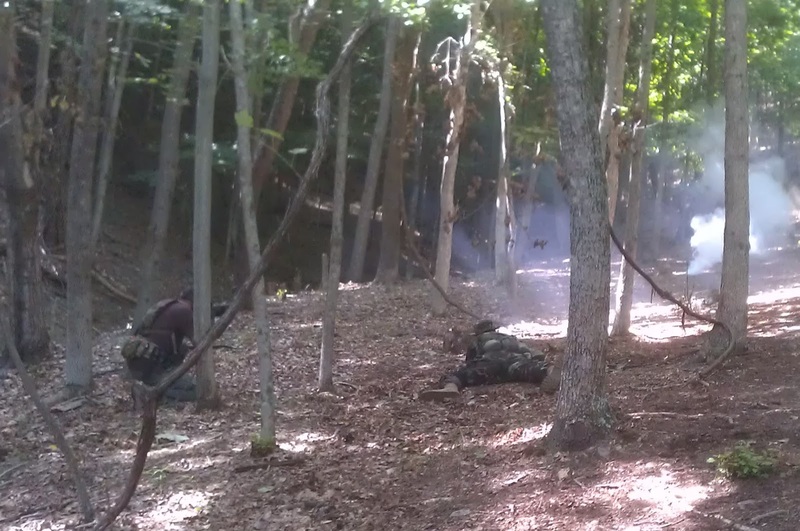 There have been some comments in response to my post: ‘Rationalizing Training Drills with Combat Reality’ that have inspired this post on the topic of the sound, range and direction of enemy fire. “From your description, it seems like understanding the differences in the sound of effective/ineffective incoming fire is a prerequisite skill. 1) Rounds passing close by/overhead: ‘crack’, ‘snap’, ‘zip’. Like a whip crack. This is the sound of a high velocity rifle round making a small sonic ‘boom’ as it passes you. High velocity rifle rounds travel faster than the speed of sound. 2) Richochet: ‘whining’ as the round spins off in a different direction. 3) Impacting: ‘pinging’, ‘clanging’ (metal) or a general ‘tearing’ as rounds rip up dirt, asphalt, wood etc. 4) Long range: ‘buzzing’ or maybe ‘zipping’ as the rounds spin out at extreme range and, I’m no ballistic scientist, perhaps lose velocity to less than speed of sound. Of course, your experience of incoming fire will be different in different circumstances, ranges and environments. If there is a general firefight going on there will be a cacophony around you and you won’t be able to tell much – but you will still know if you are being targeted and ‘pinned down’ by close fire. 1) Old fashioned ‘gallery’ style ranges. If you have the opportunity of being a target operator in an old style range, do it. This places the target handlers in what is effectively a trench below the targets, raising and lowering them on frames. You will experience the crack of shot passing through the targets above you. The advent of modern electronic pop-up ranges has made this largely obsolete. Along with the need to run down the range from the 100 to 400 meter firing points to check the targets and get corrections. Fitness and battle inoculation suffered as a result! 3) Overhead fire Gun: This is done in U.S. Army basic training on a set range to practice the low/high crawl. Recruits start in a trench at night and ‘go over the top’ up a ladder before crawling up the range for a 100 meters or so. 240 machine-guns are placed at the head of the range firing at a sufficient angle of elevation towards the crawling recruits. The guns are in towers so you can crawl up and past them without danger. The way I used to prefer to do it, in my stint training Parachute Regiment recruits, was to do it as a surprise. On the British Army field firing ranges there are dotted about these overhead fire gun towers. You put the GPMG (240) on its tripod and elevate it sufficiently. You then sandbag it in so there is no danger of it collapsing and endangering the recruits. We would give the recruit platoon orders for a night blank attack. We had live enemy on the range. I would lead them round so they were in an FUP facing up the range towards the OFG tower. They would not know they were on a range because it was a field firing range so it was just countryside. We would simulate them being compromised in the FUP by the enemy firing a schermuly parachute flare. The OFG would open up, red tracer streaking towards the recruits in the FUP. Stunned recruits. We would then hustle them into the attack against the live enemy with blanks, finally grenading the OFG tower to complete the assault. Half the time you would catch the recruits looking back over their shoulders at the red tracer streaking off into the night sky. A good method, among many to achieve battle inoculation. Battle inoculation is an interesting concept with huge utility. The more used you can get your troops senses to the sounds and experiences of battle, the less likely they will freeze when initially coming under contact for real. 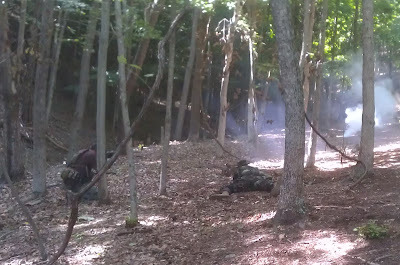 Realistic live firing field training such as that at my training site. Use of bangs, smoke and similar battle simulations. Stressful physically hard combat training. All these things will help initial performance under enemy fire. Just keep it within safety margins. Don’t fire at each other with live rounds – rounds ricochet. This is another vital reason why ‘tacticool’ square range training, pretending to prepare you for combat, does little to actually prepare you. You have to move beyond to realistic field firing. In the post ‘Rationalizing Training Drills with Combat Reality’ I discuss the difficulties of locating the enemy and subsequently winning the firefight. Achieving these two things are the basis, the cornerstone, of being able to maneuver and close with an enemy (or alternatively effectively break contact). Without taking massive casualties at least – anyone can get up and run about under enemy fire, but without correct use of the principle of fire and movement you will take casualties. Observation utilizes visual and sound. For the visual you are going to look for sign of the enemy utilizing the standard: Shape, Shine, Shadow, Silhouette, Surface, Spacing, Movement, (Thermal). You will look for muzzle flash and dirt kicked up by the enemy firing his weapon. If the enemy is using tracer it will point back towards him, but not all the way – NATO tracer lights up at approx 100 meters. But it will get you close. For sound you can listen for the general direction of the enemy fire. If you are under fire from an enemy sharpshooter, and thus the fire is not too ‘cacophonous’ then you can use the sound to estimate range. This won’t work in a full on firefight or at close ranges, anything less than 100 meters. It will help at intermediate and long ranges. Basically, you will hear the supersonic ‘crack’ as the round passes by you. The sound of the rifle being fired (the thump) follows at the speed of sound. The longer the range, the greater the delay between the two. Like lightning and thunder, if you will. In rough terms if there is a second between the crack and thump, look beyond 600 meters for your sniper. If there is less than a second, but a define delay, look in the middle distance, say 300- 600 meters. If there is not much of a delay at all you are looking closer, out to maybe 300 meters. It is hard to be more specific and scientific beyond that. If you are the sharpshooter and want to be clever, use a suppressor. There will be a crack as the round passes the enemy. But at longer ranges they will not be able to hear the thump, which sounds like a .22LR at most. Of course, the round that hits you, you don’t hear. A sniper hitting his target with a suppressed weapon at long range will only be heard by those the round cracks past as it goes to the target. Silent death. The other two methods are Fire & Movement. If the enemy has fired but you can’t locate him, you can use fire control orders to shoot into areas of likely cover to try and elicit a response, or movement. Using movement is your last resort and probably would be harder to do in a democracy, outside of solid military discipline. If there is no fire coming any more and you can’t locate the enemy, you have one or two rifleman make short bounds (3-5 second rushes) . This is an attempt it elicit a response, which you will hopefully be able to see. If there is no response, then keep people moving until you decide to move out by bounding overwatch and finally, with no incoming, continue your patrol movement. At that point a safe conclusion is that it was a ‘shoot and scoot’ hit. In a prepper type scenario I think you as the leader will just have to be the one to ‘man up’ and make the first move, not by ordering your most junior rifleman – I can otherwise imagine a “you move” “no, you move” situation developing…..! Oh, and as for the safety nuts, these are the same guys that want to fight you if you accidentally flag them with your muzzle, even though your safety is on and your finger is outside the trigger guard and it was not intentional. They really don’t have any idea what they are doing, they are just taking things they have heard and exaggerating them until everyone does it. It’s a little like the ‘five monkey’ thing, or political correctness. Safety is really important, and without it we could not train. But it is realistic effective safety that is required, that allows us to conduct realistic effective training. Talking of realistic effective training, HERE is the link to my training courses. I would like to try and get enough additional students to make up another four man team for the August 31st weekend. The September 14/15 weekend is not getting much interest at this point, I need a four man team minimum to run these training weekends. The October 12/13 course is popular and is nearly full. It seems hit and miss with these weekends, some fill up rapidly while others seem to be scheduled at bad times and only get enough students for a team or two. The August 3/4 weekend was fully booked. Crack Thump is sometimes used to determine the range and direction of of artillery and mortar fire. The US Army amateur who wrote you has been confused by his own training. A bullet is traveling at super sonic speed so when it passes over head it sounds like a fire cracker (tiny sonic boom). The sound from the shot will be heard later and will be a muffled thump sound of the muzzle blast. If my memory is correct you count from the time of the crack till the time of the thump and estimate about 100 meters per count. John: you have me a little confused. Which US Army amateur? The second quote is clearly from a Brit Army guy and he does not appear an amateur. The only confused people would appear to be you and me right now….? Did I not clearly explain what ‘crack & thump’ is, how it works and the correct context for its use in the body of the post? As to correct response to receiving enemy long range rifle fire, I will leave that to the situation individuals find themselves in, and the assets available to them, rather than quoting absolutes. It is stupid to try to use crack thump in a fire fight and I can prove it. It is not stupid within useful limits, as I explained in the article. I’m the fella that posted the second quote. For the record, during my second tour in Helmand, NES(S) to be precise, I was able to pick out the likely firing point from where my patrol (or as we used to call it Op Bait patrol) had been sniped at from. The crack/thump was in very quick succession but it was enough. After initially determining the direction of fire, I was then able to use past experience that it was coming from a small “murder hole” in a compound wall roughly 300m away. I relayed this to my multiple commander who then comm’d back to our CP, who in turn very quickly used our CP’s ISTAR to zoom in on that area……and caught the little fucker running away from the very firing point I refer to. You say it doesn’t work. My own experiences says it bloody well does. Sorry, that wasn’t an aggressive response to you MV, it was aimed at Mr Davise’ stupid comment. Any chance you might have “crack & thump” scenario set up before your 11/9-11/10 class? Considering that when the SHTF there will more than likely be a lot of sniping going on, it would be extremely useful to have experienced this situation under safe, controlled conditions rather than first experiencing it in the real world with someone who really is trying to kill you. Of course, safety would have to be properly addressed. If you need a volunteer, I’m in. Having ben “in t he pits” at Camp Perry I recognize the value of hearing stuff going overhead. Not quite a battle simulation, but still it gives you the idea.